Kurdistan. Graphic by Kermanshahi, Wikipedia Commons. Recently, the main external issue with Iraqi Kurdistan’s autonomy has been its ability to independently export and collect crude oil revenues – the backbone of its economy. 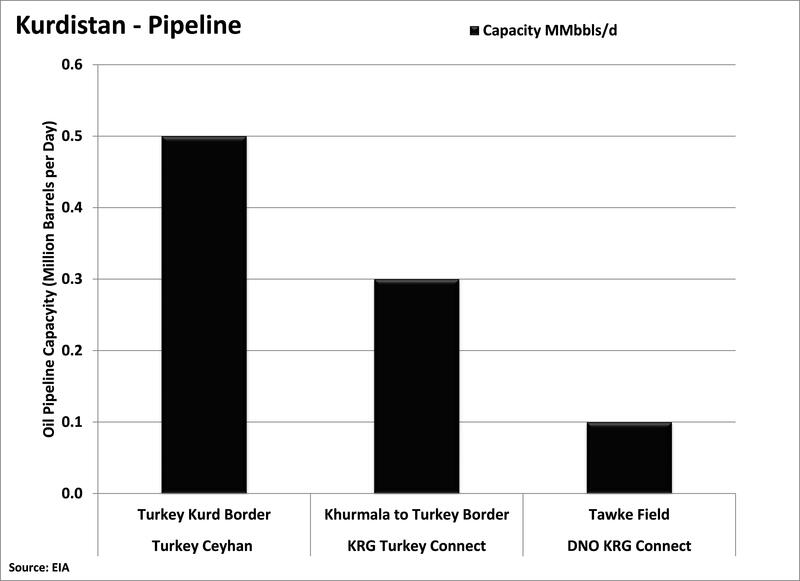 A majority of Iraqi Kurdistan oil is exported to Turkey through the Turkey Ceyhan pipeline connecting Iraqi Kurdistan’s northern border and Ceyhan, Turkey, leading to the Mediterranean Sea. 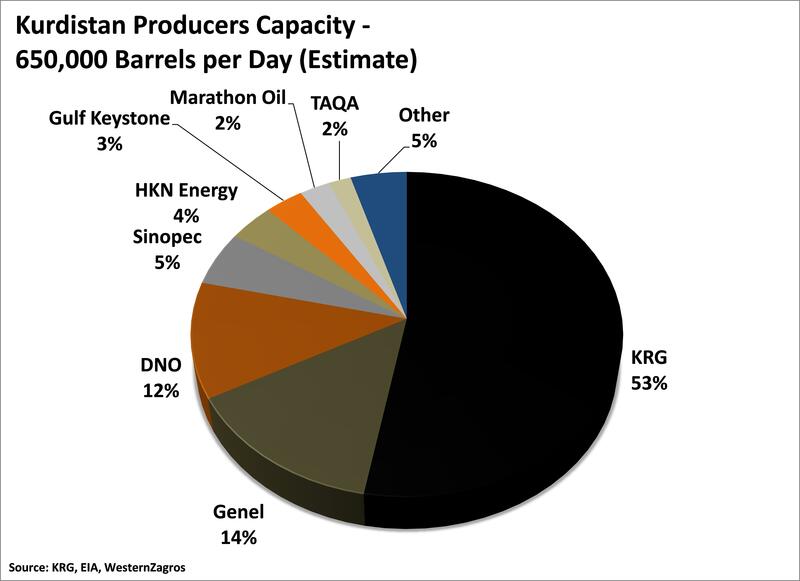 The pipeline has total capacity of 1.5 million barrels per day (MMbbls/d) with twining 46 and 40 inch pipelines. The 40 inch pipeline is the only pipeline in operation with 0.5 million barrels per day of usable capacity. 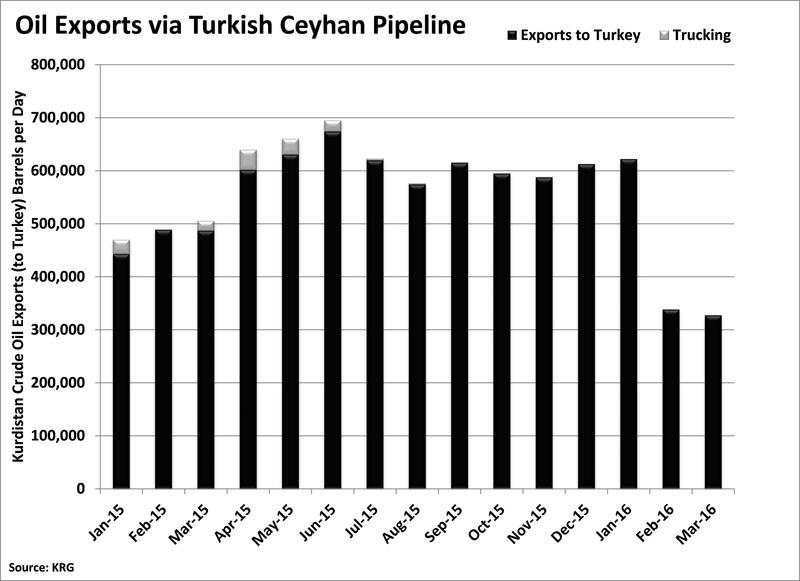 The Turkey Ceyhan pipeline is the only source of export for Iraqi Kurdish oil and has seen dramatic fluctuations. In February 2016, the Ceyhan pipeline was the target of a bombing by the suspected Kurdistan Workers’ Party (PKK) in Turkey. The pipeline was temporarily shut down for repairs and cost the KRG $250 million in lost revenues over February/March 2016. The pipeline was repaired, and Turkey provided the KRG with $200 million to deal with the lack of revenue for the 3-week closure of the Ceyhan pipeline. The KRG’s dwindling revenue due to low oil prices has become an issue that continues to affect the Iraqi Kurdish economy, but the KRG continues to transition its crude oil exports through its owned and operated infrastructure. With its transition to independently exporting and collecting crude oil revenues as of May 2015 – Iraqi Kurdistan has essentially become economically independent. 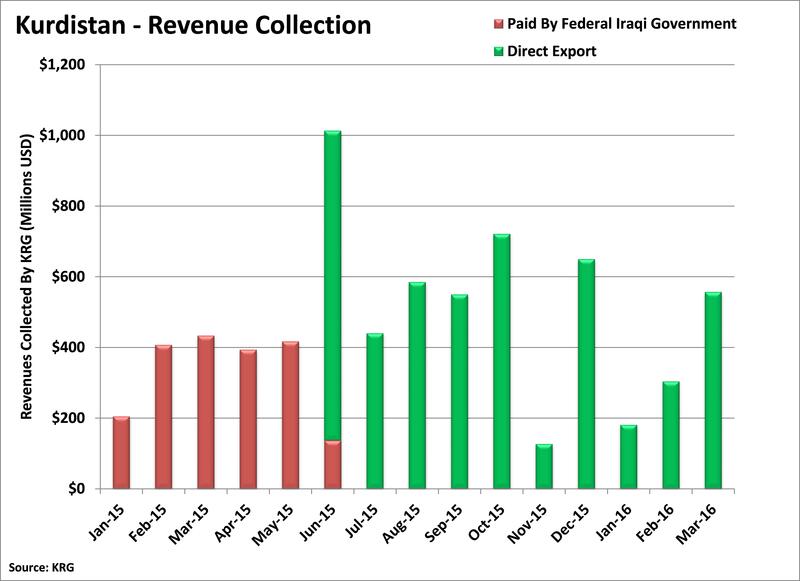 Direct oil exports and revenue collection has become an important step for the KRG as it continues to take steps to further legitimize its independence from the central government of Iraq. Instead of facing resistance to its independent oil sales to Turkey, Iraq has resorted to a desperate plea to the autonomous Kurdish region. In February 2016, Iraq’s Prime Minister, Haider al-Abadi, offered to pay the salaries of all Iraqi Kurdish employees if the KRG stops independent oil exports to Turkey. Even as the KRG struggles with making payments to its employees, partners, and continues to accumulate mounting deficits, investment continues in the Iraqi Kurdish oil industry. In March 2016, Glencore (GLEN.L) paid the KRG a $300 million advancement to market its crude oil and compete with transportation trading houses like Vitol (VITOL.UL) and Petraco. Interestingly, the most important potential contributor to the future of the KRG’s independence from the Iraqi government is Iran. In the summer of 2015, Iran had made several visits to Iraqi Kurdistan for security and economic reasons. On 28 July 2015, Iran’s Supreme National Security Council (SNSC) Assistant Secretary General visited Iraqi Kurdistan to show support for the current President Masoud Barzani. On 26 August 2015, Iran Foreign Minister Mohammad Javad Zarif met with the KRG to strengthen ties between the two regions. Iraqi Kurdistan is hoping for a flood of foreign direct investment into the region by Iran as sanctions related to Iran’s nuclear program are lifted. Iran is already Kurdistan’s second-largest trading partner behind Turkey, with close to $4 billion in annual trade, and Iran is looking to develop Iraqi Kurdistan’s infrastructure, particularly, its oil & gas infrastructure. In March 2016 it was announced that Iran was in talks to bring Iraqi Kurdistan’s oil to the Persian Gulf through Iran. Talks resumed after the Nowruz holidays on 5 April 2016, and the KRG and Iran have reached an agreement which is a month away from being finalized in Erbil, Iraq. Additionally, Iran has proposed that the KRG could send crude oil to the Persian Gulf in exchange for finished fuel products and natural gas to protect Iraqi Kurdistan from energy shortages. Making a deal with the Iranians would diversify Iraqi Kurdistan’s oil routes and result in less volatile revenues and less dependence on Turkey. 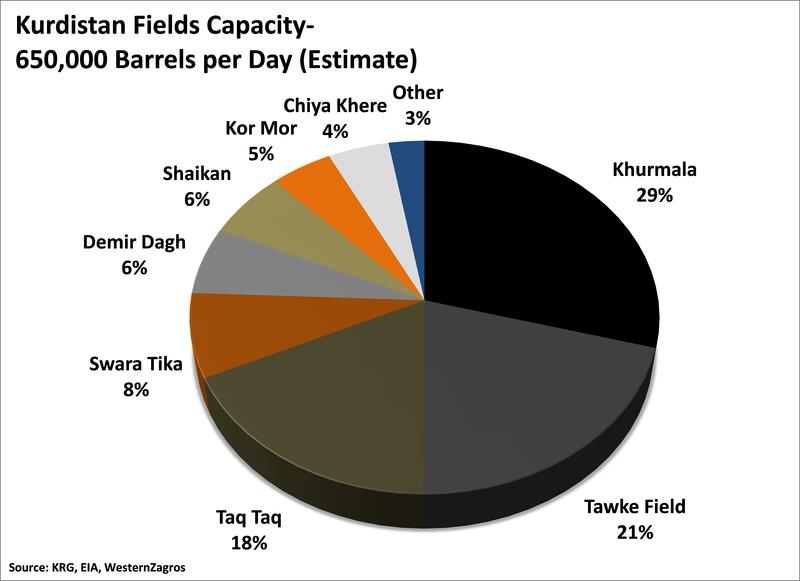 Almost a third of Iraqi Kurdistan’s oil production capacity comes from its eastern fields Taq Taq, Swara Tika, and Chiya Khere which are located close to the Iranian border and are operated by Genel Energy (GENL.L), HKN Energy, and TAQA respectively. As Iran sees sanctions lifted and Iraqi Kurdistan sees more investment by foreign countries looking to secure energy supplies – the KRG is moving closer to legitimizing their autonomy in Iraq. Companies that operate Iraqi Kurdistan’s oil fields benefit the most from outside countries providing much needed infrastructure to the regions petroleum sector. Companies have built up production capacity that has yet to be realized due to lagging infrastructure necessary to bring production to market. Iran and Iraqi Kurdistan have a long history dating back to Iran’s support of Iraqi Kurds in the early 1970s against the Iraqi government. In 1975, in accordance to the Algiers Pact, Iran withdrew its military support for Iraqi Kurdistan and the Kurds laid victim to expulsion and forced “Arabization” in their oil-rich region. Then, throughout the 1980s Iran-Iraq War, the Kurdish Peshmerga managed to use Iraq’s weakening and preoccupied military to regain small sections of its territory with the help of Iranian intelligence and weapons support. After gaining virtual autonomy in 1991, Iraqi Kurdistan was split between the northern region’s Kurdistan Democratic Party (KDP) and the southern Patriotic Union of Kurdistan (PUK) that began an Iraqi Kurdish civil war in 1996. The PUK, headed by Jalal Talabani, was supported by Iran and forced Masoud Barzani’s KDP to ally themselves with Iraq. This created uneasiness in the region with the return of Iraq’s occupation of Iraqi Kurdistan. When the Iraqi military executed 700 PUK Peshmerga, the U.S., allied with Iraqi Kurdistan, had to take action in intimidating Saddam Hussein to withdraw troops from the region. Then, in 1997, the Kurdistan Workers’ Party (PKK) based in Turkey joined the fight with the PUK against the KDP in Iraqi Kurdistan. Turkey found an opportunity to suppress the PKK movement – considered a terrorist group by Turkey – by allying with the KDP. In late 1997 the KDP and PUK agreed on a ceasefire agreement and subsequent peace treaty supported by the U.S. through the 1998 Washington Agreement. Iraqi Kurdistan was formally unified under the KRG and it would benefit from US military protection. The KRG would later benefit from its US allies during the 2003 Iraqi invasion and Masoud Barzani would become President of Iraqi Kurdistan in 2005. Ten years later (2014/2015), the Iraqi Kurds are facing a different threat in Daesh (ISIS). Daesh’s genocide of various Muslims and ethnic minorities throughout Iraq and Syria put Iraqi Kurdistan in a vulnerable situation. Acknowledging the weakness of the Iraqi army – Iran provided weapons support to the Kurdish Peshmerga to fend of Daesh. Iraqi Kurds have managed to keep Daesh’s offensive at bay with Iranian, Iraqi, and US military support. This has brought about a key understanding between Iraqi Kurdistan and Iran. The KRG acknowledged that the help of Iran was a major factor in protecting its people, economy, and autonomy. Additionally, Iran sees the KRG as a strategic ally to mutually benefit from military and economic cooperation and would portray Iran as a diplomatic leader in its respective region post-sanctions. Iran’s proposed pipeline bringing Iraqi Kurdistan oil to the Persian Gulf is a major step in acknowledging the unofficial autonomy of Iraqi Kurdistan from an Iranian-allied Iraqi central government. Although Iran would like to see a unified Iraq – Iran understands that proposed investment and cooperation in northern Iraq would need to be passed through the KRG directly. The KRG understands that this pipeline and many other proposed infrastructure projects by Iran will contribute to its economic and political autonomy. Iran will help the KRG diversify and provide options for the core supporting factor of its autonomy: Iraqi Kurdistan’s oil and gas sector.